15923.77C Brown A. 8 BIGELOW, MD, son of Eliphaz 7 ( Israel 6, Isaac 5 ,Isaac 4 , Isaac 3, Samuel 2, John 1) and Leah (WEIDMAN) BIGELOW, was born in Belleville, Mifflin co, PA on 25 September 1850. He married on 21 May 1874 Jennie E. Tate, the daughter of Nelson and Elizabeth (Stewart) Tate at McAlevy's Fort. She was born 16 August 1852 at McAlevy's Fort. Brown graduated from Jefferson Medical college in Philadelphia in 1874 and practiced medicine with his brother James H. at McAlevey's Fort for two years andf then moved to Sigleville, PA to practice medicine until 14 December 1882. At that time, he moved to Belleville to take up the practice of Dr. Eliphaz E. Bigelow (15923.73B) then just deceased. In August 1885 he was appointed to the Pension Board of Examining Physicians and served for several years. Brown died on 15 March 1908 at Belleville, and his widow on 07 February 1914. 15923.77C5 Samuel Edward, b 05 Sept 1880 Sigleville,, PA; d ___ 1952; was a physician; AKA Edward Samuel. Biographical Encyclopedia of Juniata Valley, PA Comprising the Counties of Huntingdon, Mifflin, Juniata and Perry With Sketches of Prominent Citizens, pub. by J. M. Runk, PA 1897.
also from Forge Vol 17 NO. 3 July 1988.
correspondence with descendants and their family records. My Grandfather is listed: He was Lebbeus Isaac "Ike" Bigelow - He died in our home when I was 12 (in Nogales, Arizona) I believe in 1977. I will double check. I have a lot more information that I can find and put together too. I have pictures and records and I was given the family Bible. I will submit them to you however you wish so that they can be on the website - I just didn't know how to do this. who my great grandfather was named after. His name was Eliphaz Bigelow Johnston. He was born in Huntingdon Co., Pa. His father was William Johnston, Mother Elisabeth Sarah Stelle. (I've only gotten their names from my gr-grandfathers death cert.) 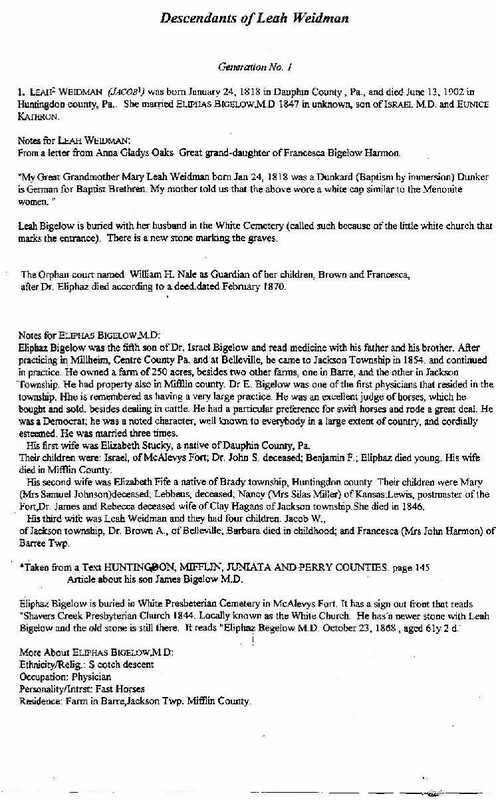 Up until last night I have had no luck looking up information on this portion of my family tree but last night I made an error typing in the name on the familysearch.com web site and putting in the first and middle name of my gr grandfather in the first and last fields, which gave me the information on Dr. Eliphas Bigelow. that I also have in my family tree. (Steele, Wadsworth). I have not yet found out what the link is and I was hoping you can tell me. I have been up against this brick wall for over five frustrating years. Unfortunately, there are no living Johnston's that are old enough to tell me any information that will help. I have picked their brains until they are mad at me. also looking for Francesca Bigelow. Barb Boese step-dau of Gayle Purcell Harman who was grdau of Fraancisca Bigelow. Looking for the parents of Wilford, Burl, Merit and Montgomery Allen. Israel 8 born 7 June 1825 in Adamsburg, PA was thus but six years of age when he traveled overland with his parents to Ohio. He remained on the farm until he reached the age of 21. During his late teens he studied medicine with the idea of going into medical practice, but for some unknown reason he instead took up a farm in 1847. Ten years later he was appointed postmaster of Plain City, and addition became a general merchant. On June 27 1847, the same year he took up a farm, Israel married Betsy A. Smith, daughter of Capt. E.Crocker and Irena (Doty) Smith. Betsy was born 21 October 1828 in Washington County, Vermont. She died 28 January 1914 in Plain City, Israel having died July 17 1896.